Nathan Swift Plus Hydration Belt - in Apr 2019? NATHAN Running Essentials products are performance driven with a unique understanding of the needs of the athlete. They want you to have your best run every time. They want you to take care of yourself and stay hydrated. They want you to be comfortable and not weighed down by your snacks and water or even your keys. NATHAN even understands that you might need to carry your phone with you and you might need some sustenance on your long run. Because they are athletes and innovators, they want you to be the best athlete possible. The NATHAN Swift Plus Hydration Belt is an example of that goal. A minimalist, bounce-free belt that is race-ready and is great for a runner or walker, this is a great fit for men or women. A 10-ounce flask comes with the belt and an angled holster for easy access without distracting from your pace and minimal disruption. The zippered pocket fits large smartphones, gel loops, keys, snacks and a trash stash pocket so you can dispose of your garbage when you get close to an actual receptacle. The NATHAN Swift Plus Hydration Belt is a waist belt that can be worn for walks, runs, hikes and even to run errands if you prefer to go hands-free. NATHAN’s Essential products are actually designed for any outdoor activity that you may need hydration for. Couch to 5Kers, triathletes, ultra-runners and road warriors all use these products to hydrate and store their personal belongings. The hydration belt can be worn in obstacle course races, trail runs or even a simple hike through a trail. It is bounce-free and fits comfortably to the waist with a lightweight feel. The minimalist hydration belt from NATHAN isn’t a bulky design and fits very comfortably. The extended side panels and padded mesh along the back interior are a lightweight material that allows the air to flow through the belt and cool your waist where it rests. 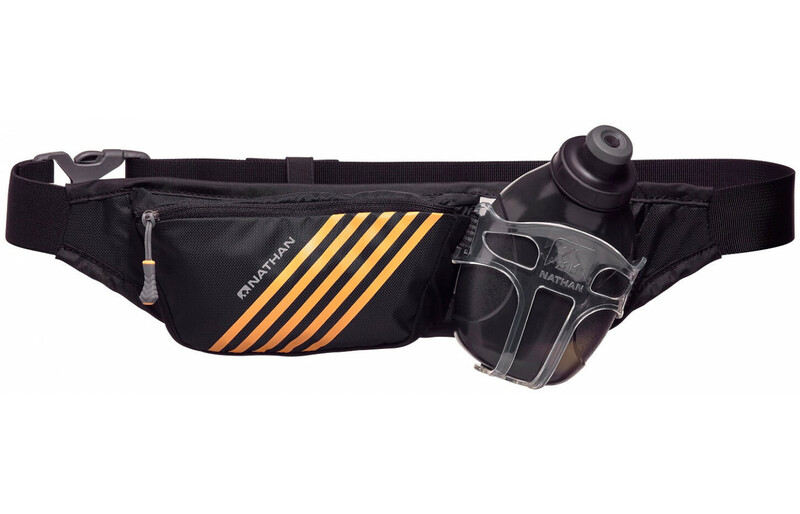 The NATHAN Swift Plus Hydration Belt comes in a one size fits most design. The belt measures from 26-inches to 44-inches fully extended. It is classified as unisex so there is no difference between a male or female design. 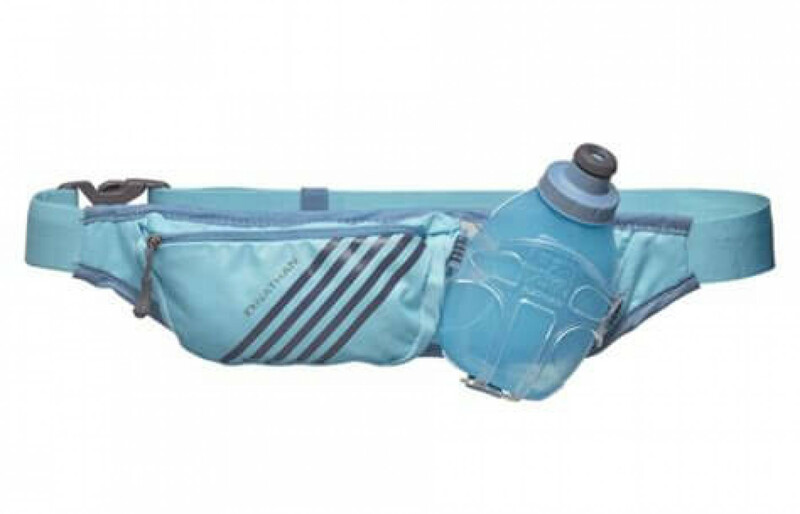 Considered a minimalist hydration belt, the total weight of this product is 7-ounces. To keep it lightweight, the fabric is a combination of 40% nylon and 60% polyester that is lightweight and has a stretchy feel to it. Extended side panels hug the body comfortably for a custom fit but do have just enough stretch to fit any size. The included flask has an easy-squeeze design with the NATHAN Push-Pull cap flask and a soft silicon nozzle to go easy on teeth while still holding its shape. This makes it easy to open, even with wet or sweaty hands. This hydration belt comes in a one size fits most design. Stretching from 26-inches to 44-inches fully extended, the NATHAN Swift Plus Hydration Belt is versatile and unisex. The adjustable belt has a front clip closure for an easier installation. The included flask is a 10-ounce easy-squeeze bottle with a Push-Pull cap and a soft silicon nozzle that holds its shape and doesn’t leak. The NATHAN Swift Plus Hydration Belt is made by athletes for athletes to depend on, regardless of distance or style of run. This belt has enclosed edges with a durable nylon/polyester combination fabric. This keeps the belt lightweight and less likely to tear or fray. By making the belt smaller and giving it a snug, adaptable fit to the waist, it keeps the external part in the front of the body, and not on the back where it is likely to get caught by passing branches and obstacles. The large clip closure on the belt secures it firmly with a locking click that applied pressure can remove. The zipper has a toggle feature that opens and closes the zip while on the run without pulling in a direction that could damage the seams. The 10-ounce flask that is included with the NATHAN Swift Plus Hydration Belt is an easy-squeeze design with the NATHAN Push-Pull cap. It also has a soft silicon nozzle that is easy on the teeth, holds its shape, and doesn’t leak. The BPA and PVC-free flask won’t leech a plastic taste into your water and both the bottle and cap are dishwasher safe on the top rack. The NATHAN Swift Plus Hydration Belt comes with the 10-ounce easy-squeeze NATHAN Push-Pull cap flask. The flask has a soft silicon nozzle that holds its shape and doesn’t leak. It is also easy on the teeth if you’re in a hurry and aren’t always accurate with your pour. This flask delivers a high flow rate of liquid with little effort, which is great if you’re already exhausted from a long run. The soft grip cap is easy to open, even with wet or sweaty hands. The construction of the flask is BPA and PVC-free and won’t leech a plastic taste into your water. It is also dishwasher safe if you’re washing the bottle and cap on the top rack. The minimalist NATHAN Swift Plus Hydration Belt is lightweight with a large front pocket and flask holder. The padded mesh along the back interior is a low-key addition that is light and breathable. The belt is adjustable with a front clip closure and a zippered pocket that fits up to an iPhone 7/8 Plus along with gel loops, keys and has a stash pocket for your trash. There are also extended side panels that hug the body comfortably for a custom fit. The main body of the hydration belt is made up of 40% nylon and 60% polyester for a lightweight, stretchy feel. This product is available in two options: black with orange stripes as well as a gray zipper and weighted toggle or blue radiance with dark blue stripes. This minimalist, lightweight hydration belt is a race-ready addition to your running gear. You have a 10-ounce flask, a large pocket for your important items, and even a trash stash pocket. You have an adjustable belt and comfortable material that won’t sweat you out of your belt. With all of these great features, you are offered a great price that is competitive with all of the other belts in this genre. It’s a win-win situation. NATHAN Running Essentials products are available in every store that sells running equipment: specialty running shops, outdoor gear stores, big box stores, and sporting good stores. They are a definite favorite in the running world, creating products for athletes and runners all over the world, in over 45 countries. Their product range is from industry-leading hydration vests and belts, handhelds, bottles, and running packs to active visibility and reflective vests. They care about runners and want to continue to make your next run your best run. NATHAN believes that everyone runs for different reasons, whether they are emotional, spiritual, physical or competitive. And they’re right. Whatever the reason you choose to run or why you are guided to do so, NATHAN believes we are all “a tribe bound by a common activity” and they will continue to create products that will enable you to continue that activity. The NATHAN Swift Plus Hydration Belt is one of many hydration belts available currently but it is also one of the most comfortable, lightweight belts you can pick up. The flask is soft and comfortable and easy to use even when you’ve been clenching your fits for 5 miles and may not have any strength left. The nozzle is soft and won’t hurt your teeth. The belt itself won’t bounce against you, distracting your rhythm and messing with your time. You won’t have those issues. This belt is comfortable and feels like an extension of your clothing.